On the outskirts of Chalon-sur-Saône, La Route Touristique des Grands Vins leads you on an exploration of the wine estates of the Côte Chalonnaise. Beyond the pleasures of wine-tasting, discover pretty villages, animated with events that celebrate all things wine. You can also explore the celebrated Voie Verte, a charming tree-lined trail loved by cyclists which runs alongside the Canal du Centre. Color, aromas and flavor. Each glass of Bourgogne wine has its own specific qualities. To better enjoy your tasting experience, learn more about these subtle nuances. 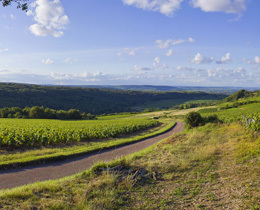 To the west of Chalon-sur-Saône, under three hours by train from Paris, the Côte Chalonnaise offers a wealth of wines and hilly landscapes to discover. To appreciate these wonders, follow La Route des Grands Vins : between the delightful valleys of the Maranges and the Grosne, it runs through 40 communes. Here, for more than 1,000 years, the vines planted by the Cluniac monks have taken over the hillsides . On the way, you will discover winegrowing estates and imposing winemakers’ houses that bear witness to an age-old tradition. The winegrowers will take pleasure in welcoming you to their estates. To the north of the Côte Chalonnaise, they produce red wines from well-known appellations such as Rully and Mercurey, fleshy and fruity wines with a beautiful ruby color. If you stop farther south, you can enjoy the sophisticated and delicate white wines of Montagny or Givry. In Givry, they also produce some elegant red wines that were a favorite of Henri IV. There are plenty of opportunities for walks in the country along La Route des Grands Vins. On foot, on rollerblades or by bike, you can explore the 32km of the Voie Verte, a paradise for cyclists. This pleasantly shady trail runs alongside the Canal du Centre, which is also a busy waterway for tourists. Perhaps you’d prefer to explore the Côte Chalonnaise on horseback ? Take one of the four trails around Givry and learn all the secrets of the village and its winegrowing heritage. 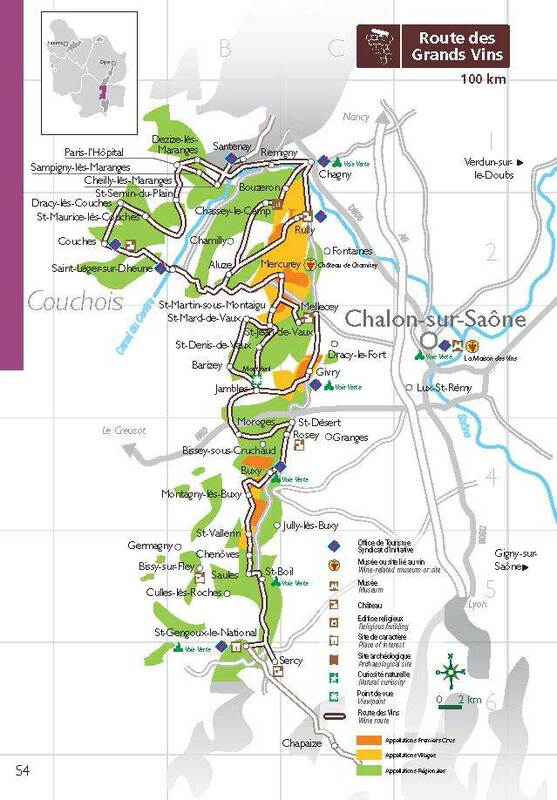 From La Route des Grands Vins, take a detour through Chalon-sur-Saône. Here, you can visit a fascinating museum dedicated to Nicéphore Niépce, the inventor of photography, or the Maison des Vins de la Côte Chalonnaise, dedicated to the region’s appellations. Year round, there are plenty of fun festivals to discover along La Route des Grands Vins. In the spring, the Les Musicaves festival celebrate the wine of Givry through music. In mid-October, you are invited to the Paulée de la Côte Chalonnaise (Chalon-sur-Saône), to celebrate the end of the harvest in a fitting manner. 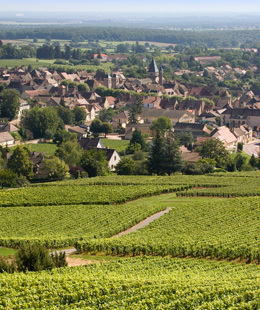 To organize your trip, contact the Association de la Route Touristique des Grands Vins de Côte Chalonnaise en Bourgogne.